The art of storytelling is coming to an end. One reason for this phenomenon is obvious: experience has fallen in value. With the [First] World War, process began to become apparent which has not halted since then. Was it not noticeable at the end of the war that men returned from the battlefield grown silent – not richer, but poorer in communicable experience? For never has experience been contradicted more thoroughly than strategic experience by tactical warfare, economic experience by inflation, bodily experience by mechanical warfare, [and] moral experience by those in power. According to Benjamin, individuals returned from the war unable to communicate their experiences. They returned to a world unfamiliar to them driven by technology information that was no longer slow-changing. Benjamin, in his writing, evokes a sense of nostalgia for a past world where storytelling was a communal and interactive experience. 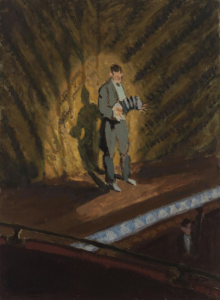 Sickert’s painting of Percy Honri at the Oxford, though produced in 1922, seem to portray the Oxford before it was renovated and modernized in 1921. The isolated performer evokes a similar alienation with the present and a desire for a certain past. Sickert’s fascination with the urban environment is demonstrated through his artistic engagement. Favoring a personal version of impressionism, Sickert’s first major works were portrayals of scenes in London music halls. Observable in his paintings, the music halls were often depicted with warm colors and often with the inclusion of an audience. However, this painting of Percy Honri performing at the Oxford, contrasts the essence that his previous works embodied. The gloomy colors, and isolated performer creates a somber tone that seems to invoke a sense of nostalgia. It is also important to note that Sickert’s second wife passed away in 1920, only a couple years before this painting.